Homemade, nonstick, baking pan set! Create great tasting, healthy donuts at home. Theyll look like the ones at the local bakery, but because theyre baked, theyll have much less fat, fewer calories, and no preservatives. Once you make your favorite donuts, you can decorate them, with the bonus pastry injector and decorating nozzles. 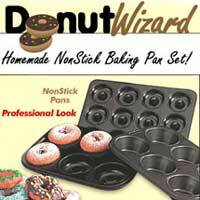 If your family likes healthier tasty donuts, youll like the Donut Wizard.